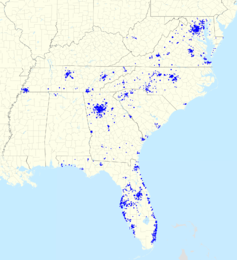 SunTrust locations in the United States. SunTrust Banks, Inc. is an American bank holding company. The largest subsidiary is SunTrust Bank. It had US$199 billion in assets as of March 31, 2018. SunTrust Bank's most direct corporate parent was established in 1891 in Atlanta, where its headquarters remain. On February 7, 2019, it was announced that SunTrust Banks would be bought by BB&T for $28 billion in an all-stock deal, creating the sixth largest U.S. lender in the biggest bank deal since the 2007-2009 financial crisis. As of September 2016, SunTrust Bank operates 1,400 bank branches and 2,160 ATMs across 11 southeastern states and Washington, D.C.. The bank's primary businesses include deposits, lending, credit cards, and trust and investment services. Through its various subsidiaries, the company provides corporate and investment banking, capital market services, mortgage banking, and wealth management. It has nearly 24,000 employees. In 2013, it was ordered to pay $1.5 billion "to resolve claims of shoddy mortgage lending, servicing and foreclosure practices," and it reached a preliminary $968 Million settlement with the US government in 2014. On September 21, 1891, SunTrust's most direct corporate ancestor, the Trust Company of Georgia, was granted a charter by the Georgia General Assembly as the Commercial Travelers' Savings Bank of Atlanta. The founders were John M. Green, Joel Hurt, H. L. Atwater, W. A. Hansell, T. J. Hightower, J. G. Oglesby, J. D. Turner, John B. Daniel, Joseph Hirsch, Leon Lieberman, Louis Wellhouse, A. J. McBride, D. O. Dougherty, W. A. Gregg, W. W. Draper, A. C. Hook, W. T. Ashford, George W. Brooke, C. I. Branan, and C. D. Montgomery. In November 1893, it restructured as a trust company and renamed itself Trust Company of Georgia. The earliest predecessor of Sun Bank was founded in 1911 as The People's National Bank in Orlando, Florida. In 1920, it became the First National Bank. During the Great Depression, the First National Bank and Trust Company failed in the early 1930s. It was reorganized on Valentine's Day 1934 as the First National Bank at Orlando. In 1973, the bank merged with other Orlando banks to become SunBanks. It had three bank-related subsidiaries and total assets of $1.713 billion as of December 31, 1973. In the early 1980s, Sun went on a buying spree that raised at least some eyebrows, as it positioned the bank for the state of Florida to eventually allow interstate banking. It rolled up 81-year-old Hillsboro Bank, based in Plant City, an institution with $150 million in assets and then the third-oldest state-chartered bank. It also bought Florida State Bank of Tallahassee, which had tried to merge with Sun in 1973, but the deal fell apart when the economy soured. Then, in May 1983, Sun announced a deal for Miami-based Flagship Bank Inc., with $3.3 billion in assets, that catapulted Sun to be one of the Florida's largest bank holding companies. The Flagship deal was the seventh struck by Sun in less than a year. In 1985, Trust Company of Georgia and SunBanks merged to form SunTrust Banks, Inc. The merged company continued to operate as Trust Company Bank in Georgia and Sun Bank in Florida. The newly merged company made its first major deal a year later, when it purchased Third National Corporation of Nashville. In 1995, SunTrust retired the Trust Company Bank, Sun Bank and Third National names and rebranded all of its banking subsidiaries as SunTrust. SunTrust purchased Crestar Financial Corporation of Richmond, Virginia in 1998, expanding the company's footprint into Virginia, Maryland, and the District of Columbia. Crestar was founded in 1865 as State Planters Bank of Commerce and Trusts in 1865, becoming United Virginia Bank in 1969 and Crestar in 1987. Crestar's (and SunTrust's) earliest predecessor, Farmers Bank of Alexandria, was founded in 1811. In 1988, Suntrust was added to the S&P 500 Stock Price Index. In 2001, SunTrust purchased the institutional businesses of the Robinson-Humphrey Company, LLC. creating SunTrust Robinson-Humphrey. The company bought Memphis-based National Commerce Financial Corporation (NCF) for $7 billion in 2004. The bank operated as National Bank of Commerce in South Carolina, Tennessee, Mississippi, Arkansas, Alabama, Georgia, Virginia, and West Virginia and as Central Carolina Bank and Trust in North Carolina. This acquisition allowed SunTrust to enter Alabama, the Carolinas, and West Virginia for the first time, and substantially increased its footprint in the other states. In 2013, the bank led a bank group that included Fifth Third Bank and Florida Community Bank that helped finance the acquirement of BEL USA, the parent company that owns DiscountMugs, by Comvest Partners, a private equity firm. In 2014, SunTrust announced it would launch a medical specialty group to work with independent medical practices. On September 16, 2014, the Atlanta Braves announced the name of their new Cobb County stadium: SunTrust Park. SunTrust Park, which is expected to be unveiled in time for the first pitch of the 2017 season, will serve as the new home of the Atlanta Braves. The $1.1 billion construction project in Cobb County will include restaurants, shops, offices, a hotel, and residential spaces directly connected to the park. The Braves organization is making history by building out the development at the same time the stadium is being constructed. On February 7, 2019, BB&T reported that it would acquire SunTrust to create the sixth-largest US bank, with assets of $442 billion and market capitalization around $66 billion. The merged bank will be headquartered in Charlotte, North Carolina under a new name, but will retain significant operations in Atlanta. It was subsequently announced that Atlanta will be the merged bank's headquarters for wholesale banking, while Winston-Salem will be the headquarters for community banking. This could mean more jobs in both cities. SunTrust had been the last major bank headquartered in Atlanta, which had been the South's financial capital for much of the 20th century. The Robinson-Humphrey Company, one of Atlanta's oldest and important companies, was acquired by SunTrust in 2001. However, SunTrust had long coveted Robinson-Humphrey, reportedly having pursued it for more than 80 years. Trust Company of Georgia, the oldest progenitor of SunTrust, was rebuffed in an effort to buy Robinson-Humphrey in 1917. The firm was founded as a municipal bond shop by Roby Robinson in 1894. Robinson and William G. Humphrey, a bond trader from Toledo, Ohio, eventually incorporated The Robinson-Humphrey Co. in 1902. It blossomed into the leading investment banking firm in the South under Chairman Justus Martin Jr., who helped broaden its ties to Atlanta corporations, European clients and the firm's wealthy families who were brokerage clients. Martin was at the helm when Robinson-Humphrey commissioned the building of the bold Atlanta Financial Center in city's tony Buckhead business district in the early 1980s. In 1982, Martin sold Robinson-Humphrey to American Express, which was then run by another Atlanta deal maker and fellow Georgia Tech grad, James Robinson (no relation to Roby Robinson). Under AmEx, the firm operated as part of Shearson Lehman Brothers Inc. In 1993, deal maker Sandy Weill orchestrated a deal for Shearson's retail division, and Robinson-Humphrey was included in the sale, using the Smith Barney unit of Primerica Corp. The company operates three primary business units: Consumer Banking & Private Wealth Management, Wholesale Banking, and Mortgage. As of September 2016, SunTrust Bank operates 1,400 bank branches and 2,160 ATMs across including Alabama, Arkansas, Florida, Georgia, Maryland, Mississippi, North Carolina, South Carolina, Tennessee, Virginia, West Virginia, and Washington, D.C. The bank announced in 2018 that it will close its last five West Virginia branches, all in Kroger stores. On April 21, 2011, William H. Rogers, Jr., began a transition into the CEO role previously held by Jim Wells, who retired December 31, 2011. Formerly SunTrust's COO, Rogers assumed the title of CEO on June 1, 2011. Rogers had been named President in 2008. At that time, the current Chief Financial Officer (CFO) is Aleem Gillani was named in April 2011. In 2015 and 2016, two corporate treasurers have gone on to become CFOs at large regional banks, including Kevin Blair at Zions Bancorporation and Paul Burdiss at Synovus, and a unit strategy head, Inder M. Singh, became CFO at IT firm Unisys. SunTrust had a long-standing relationship with The Coca-Cola Company. In 1919, Ernest Woodruff, president of the Trust Company from 1904 to 1922, and W. C. Bradley bought The Coca-Cola Company for $25 million and restructured. The Trust Company of Georgia helped underwrite the initial public offering, accepting shares of Coke in exchange for its services. Four years later, his son, Robert W. Woodruff, was elected Coca-Cola's president, a title he would hold until 1954 and was a board member until 1984. As a result, SunTrust owned 48.3 million shares (3.58%) of Coke as of 2006, which had a GAAP cost basis of $110,000. In addition, the original copy of the formula for Coca-Cola was stored in a safe deposit box of an eventual SunTrust location in Atlanta (originally a Trust Company Bank location) from 1925 to 2011. It was eventually moved to a purpose built vault in the World of Coca-Cola, also in Atlanta. Over the years, Coca-Cola executives would sit on SunTrust's board of directors and SunTrust execs would sit on Coca-Cola's board. SunTrust started to divest Coke shares in May 2007, when it sold 4.5 million, or 9% of its position. In 2008, the bank sold another 10 million shares, donated 3.6 million to SunTrust's charitable foundation, and crafted a plan to sell more shares in 2014 and 2015. However, in September 2012, SunTrust sold all of its Coke shares at the behest of its primary regulator, the Federal Reserve. SunTrust was forced to resubmit its capital plan – known as Comprehensive Capital Analysis and Review (CCAR) – after it failed part of the stress test in March 2012. The Coke shares (or any stock holding) held by SunTrust would weigh on the bank's capital ratio under new capital rules within Basel III. Thus, SunTrust decided to accelerate its plan and sold the Coke shares earlier than expected. In 2014, the Federal government together with state attorneys general in 49 states and the District of Columbia reached a settlement requiring SunTrust Mortgage, Inc., to provide $500 million in various forms of relief to mortgage borrowers. The United States District Court for the District of Columbia entered the Consent Order on September 30, 2014. The consent order addressed SunTrust's alleged misconduct regarding its mortgage servicing and foreclosure practices. SunTrust was also required to create a 40 million dollar fund for the approximately 45,000 SunTrust borrowers who were foreclosed upon between January 1, 2008 and December 31, 2013. In addition, SunTrust was required to adhere to significant new homeowner protections. The consent order required that SunTrust follow the servicing standards set up by the 2012 National Mortgage Settlement (NMS) with the five largest banks. In September 2015 SunTrust laid off one hundred IT professionals with a controversial severance agreement clause by SunTrust that required laid-off employees to be available to help without pay for a period of two years. On October, 23rd Suntrust reversed course and removed the clause: "to make myself reasonably available to SunTrust regarding matters in which I have been involved in the course of my employment with SunTrust and/or about which I have knowledge as a result of my employment with SunTrust." Located at 200 South Orange Avenue, The SunTrust Center is the tallest building in downtown Orlando, Florida. The 35 story, 650,000 sq ft (60,000 m2) building was constructed in 1988 at a cost of approximately $100 million. It is constructed of reinforced concrete and granite with marble finishes and features 17 elevators. ^ "SunTrust Corporate Profile". Yahoo! Finance. Retrieved 2019-02-26. ^ "STI Annual Balance Sheet". MarketWatch. Retrieved 2019-02-26. ^ "FDIC Institution Directory: SunTrust Bank". 2.fdic.gov. Retrieved 2017-08-10. ^ a b "BB&T and Suntrust to combine in an all-stock merger of $66 billion". CNBC. Reuters. February 7, 2019. Retrieved February 7, 2019. ^ a b "SunTrust Corporate Profile". SunTrust.com. Retrieved 23 September 2016. ^ Zibel, Alan; Johnson, Andrew R. (June 17, 2014). "U.S. Reaches $968 Million Mortgage Settlement With SunTrust". The Wall Street Journal. Retrieved October 27, 2018. The pact also doesn't resolve an investigation by federal authorities of SunTrust's participation in a U.S. Treasury Department mortgage-modification program. The bank said in the February filing that it could face "substantial penalties" stemming from that probe. ^ a b "Historical Highlight". SunTrust.com. Retrieved 23 September 2016. ^ a b Garrett, Franklin M. (1969). Atlanta and environs : A Chronicle of Its People and Events, 1880s-1930s. Athens, Ga.: University of Georgia Press. p. 235. ISBN 0-8203-0264-3. ^ "Orlando City Planning" (PDF). CityofOrlando.net. Retrieved 23 September 2016. ^ "Sun Bank Earnings Reported". Lakeland Ledger. February 12, 1975. Retrieved 23 September 2016. ^ a b Stuart, Reginald (May 16, 1983). "FLORIDA'S BANK-MERGER SPREE". New York Times. Retrieved 23 September 2016. ^ "Institution History for TENTH & MAIN BRANCH (47920)". Federal Financial Institutions Examination Council. ^ a b "Page Not Found - SunTrust" (PDF). Suntrust.com. ^ "SunTrust to buy National Commerce Financial". Atlanta Business Chronicle. 2004-05-09. p. 1. Retrieved 2007-04-08. ^ "Comvest Invests in BEL USA, Adds On Branders.com". PitchBook. 17 March 2014. Retrieved 30 December 2014. ^ Dunford, Thomas (24 December 2013). "The Morning Leverage: What's Waiting in Private Equity's Stocking?". The Wall Street Journal. Retrieved 30 December 2014. ^ "Comvest Investment Partners IV, L.P.; Amin Rahman Ramjee". Federal Trade Commission. 20 December 2013. Retrieved 30 December 2014. ^ Correia, Margarida. "SunTrust Private Wealth Management Launches Medical Specialty Group". Bank Investment Consultant. Retrieved 27 June 2014. ^ Tucker, Tim (16 September 2014). "Braves name their new stadium: SunTrust Park". ajc.com. Retrieved 26 May 2015. ^ Riley, Cindy (13 May 2015). "SunTrust Park to House Atlanta Braves in 2017". constructionequipmentguide.com. Retrieved 26 May 2015. ^ Richard Craver (February 11, 2019). "New name for BB&T-SunTrust may help deliver new identity to customers, marketplace". Winston-Salem Journal. ^ Craver, Richard (February 10, 2019). "BB&T headquarters move to Charlotte stings but silver lining could be more local jobs". Winston-Salem Journal. Retrieved February 10, 2019. ^ a b Murray, Brendan. "R-H expansion plans include Boston, London - Atlanta Business Chronicle". webcache.googleusercontent.com. Atlanta Business Chronicle. Retrieved 8 February 2019. ^ "Justus Carlile Martin Jr.-Obituary". The Atlanta Constitution. Retrieved 8 February 2019. ^ a b "Barclays Global Presentation" (PDF). SunTrust.com. Retrieved 23 September 2016. ^ Garland, Max (March 4, 2018). "SunTrust Banks to close five remaining WV branches". Charleston Gazette-Mail. Retrieved April 3, 2018. ^ "Aleem Gillani". Suntrust.com. Retrieved 30 September 2016. ^ Adams, Tony (July 11, 2016). "Synovus taps SunTrust executive for chief financial officer". ledger-enquirer.com. Retrieved 30 September 2016. ^ Nemeroff, Evan (March 20, 2015). "Zions Taps SunTrust Treasurer to Replace Retiring Chief Financial Officer". American Banker. Retrieved 30 September 2016. ^ "Chief Financial Officer (CFO) Janet Haugen to Retire from Unisys; Company Names Inder M. Singh to Succeed Haugen as CFO". Prnewswire.com. Retrieved 30 September 2016. ^ Borowsky, Bruce (2005-03-11). "SunTrust Banks (Trust Company Bank)". New Georgia Encyclopedia. Georgia Humanities Council. Retrieved 2006-12-10. ^ Coporate. "Coca-Cola Moves Its Secret Formula to The World of Coca-Cola". Coca-Cola Journey. Coca-Cola Company. Retrieved 28 June 2016. ^ Stafford, Leon. "Coke hides its secret formula in plain sight in World of Coca-Cola move". The Atlanta Journal-Constitution. The Atlanta Journal-Constitution. Retrieved 28 June 2016. ^ "Officers & Directors". SunTrust Banks, Inc. Retrieved 2007-04-08. ^ "Board Of Directors". The Coca-Cola Company. Retrieved 2007-04-08. ^ "SunTrust Selling Coke". USAToday.com. May 15, 2007. Retrieved 23 September 2016. ^ Gross, Daniel (2008-07-23). "DESPERATE BANKS SELLING OFF HARD ASSETS". Newsweek. Retrieved 23 September 2016. ^ MATTHIAS RIEKER and SAABIRA CHAUDHURI (October 22, 2012). "SunTrust Profit Soars on Coke Stock Sale". Wall Street Journal. Retrieved 23 September 2016. ^ Benoit, David (September 6, 2012). "SunTrust Sells Coke Shares and Bad Loans". Wall Street Journal. Retrieved 23 September 2016. ^ Thibodeau, Patrick. "In turnabout, SunTrust removes contentious severance clause". Computerworld.com. Retrieved 2017-08-10. This page was last edited on 19 March 2019, at 01:52 (UTC).